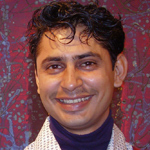 Bhand, Vishal C. is Head and Associate Professor in Design at Silpa Sadana, School of Craft and Design at Visva Bharati University, Santiniketan. He has designed several courses on cultural practices and design process and closely worked with craftspeople in the area of wood, textiles, metal, ceramics and leather. He is a widely travelled scholar with keen interest in Indian art and craft.